Is sustainable consumption compatible with increasing the income among the poor and the middle class? I recently attended a workshop convened by the Urban Sustainability Directors Network, USDN, on the topic of sustainable consumption. One of the issues that repeatedly came up was how to address income inequality while also promoting sustainable consumption. To pursue either of these two big questions is a big undertaking already, but the two together are mind boggling. So I took some time to educate myself on the relationship between household income and its GHG footprint (the latter standing for energy and material consumption). My key finding is that household income is a strong predictor of that household’s carbon footprint. This correlation is consistently and unambiguously reported in several recent studies in the US and Europe. As shown in the figure from the 2014 report by Center for Global Development among the US households the correlation is linear for the bottom 80% of income categories (up to approximately $120,000 for a family of four) and accelerates above it. The greatest acceleration is among the top 2% of income. Stated differently: the more we earn the greater our GHG footprint is, with households earning more than about $120,000 engaging in more carbon intensive lifestyle choices and amenities. 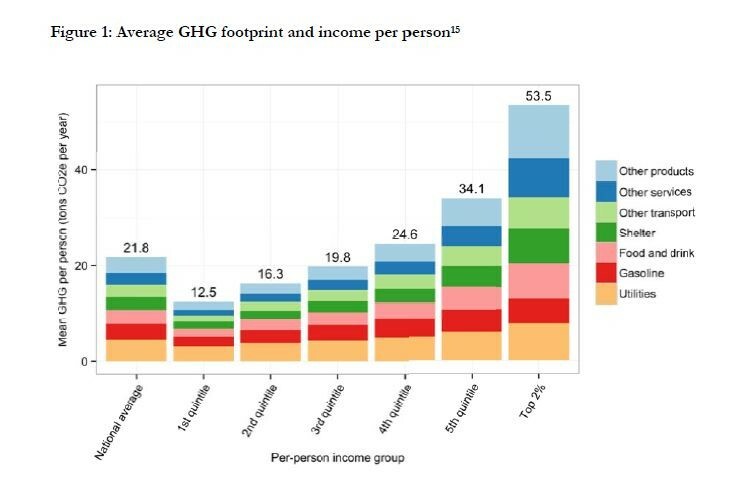 One caveat is that it seems to me that the GHG footprint estimates for households in the top 5% income bracket are rather uncertain in all the studies I examined, but for the households in the 95% category (up to $200,000) the data seem to be strong. With this knowledge, I tried the following thought experiment. Suppose we were to decrease income inequality by reducing the number of households with the extremes of income (at the top and the bottom) and increase the number of households in the remaining categories, say between 20 and 80% income brackets. How would it change the total consumption-based GHG emissions? The answer is: they would remain more or less the same or because the top earners seem to be more GHG intense per dollar spent than the rest of us, perhaps a little lower. In another thought experiment consider what would happen to the total national GHG footprint if we reduced the proportion of households in the lowest income bracket by moving them into the middle-income category, without touching the households in the top category. The answer is that the total emissions would increase. This is a disturbing thought in light of the questions posed by the Urban Sustainability Directors: raising the income of those who most need it will result in greater total greenhouse gas emissions unless we simultaneously reduce the income at the top. The latter is not only a political problem but also is largely outside the jurisdiction of municipalities. And come to think of it, increasing the income of the bottom earners is also for the most part outside the options available to municipalities. So what can municipalities do? One idea that comes to mind is that instead of thinking of income, which households seem to be always converting into carbon emissions, the municipalities can think of providing quality of life (and keeping an eye on GHG emissions while doing so). The case in point would be to provide affordable high-quality middle-class housing in locations conducive to good life that is also extremely energy efficient. Extremely energy efficient construction, including the so-called “passive house” construction, is a technical challenge that has been already solved, but most developers and municipalities do not practice it. I will not go into this matter in this posting. Rather, I want to focus on affordable middle-class housing and good life. To pursue it, municipalities will need to think outside the box of the dominant model of a private developer and token subsidised units for the poor. In my next post, I will describe an amazing housing project in New York City, known as Penn South, that delivers high quality of life, affordable housing and a thriving community life on a modest GHG footprint in the centre of one of the most expensive cities in the world. It seems to me that you have temporarily ignored the fact that average greenhouse gas emissions per person in all income brackets will have to fall rapidly to meet climate targets. This will, hopefully, result from major new investments in energy efficiency and renewables. What you have shown is that changing income patterns alone is not a solution! The excellent bar chart reveals that even the lower U.S. income quintile is well above current ‘best science’ targets of somewhere between 1-4 Mt CO2e. I believe the temporal challenge is bigger than both the stated problem or proposed solution. I do not argue with the philosophical goal of closing the equality wealth gap but for the purpose of obtaining cultural stability for all world citizens, our current challenge is transformational shift on vast scale which is almost certainly only to be obtained by comprehensive policy regulatory schemes or involuntary cultural breakdown accompanied by incomprehensible human suffering and ecological unraveling. Culturally, it is a collective action problem, which necessitates much more than picking around edges. Our emphasis, I believe, is electoral, however bleak that may now seem. First a disclaimer. Though Halina and I collaborate on a number of SCORAI-related projects and are in practically daily contact, my comments here are entirely spontaneous. I read her blog on sustainable consumption and income inequality on a particular Saturday morning and these remarks are entirely extemporaneous. My apologies in advance for the length of this commentary. Halina focuses on more equitable access to affordable housing as an underlying element of “good life” but I am prompted to speculate whether her focus is unduly narrow (for readers for whom this term has a peculiar ring I offer the clarification that it is a direct translation of “Gutes Leben,” a notion that has been extensively elaborated in recent years in the German-language literature on sustainability). My point of departure for today is decidedly personal and stems from the fact that I live in a fairly prosperous town with generally excellent public amenities. This suggests an unavoidable focus, at least for the moment, on the relatively more affluent quintiles in Halina’s graph. I have long been bemused that many of my fellow residents feel compelled to dash off to a distant locale whenever they have a few days of “free time.” To be sure, some of this apparent desire to recurrently abandon their hometown for Disneyworld, Colorado, Hawaii, or the Caribbean derives, like much of our consumption, from contemporary forms of status expression and priming fostered by near-ubiquitous marketing, but it is also arguably motivated by an impression of the inadequacy of proximate diversions. To make sustainable consumption and good life more meaningful, an operative question might be: What would it take to encourage my neighbors (and others like them) to remain at home when they get the urge to travel on a wholly recreational basis (and hence substitute the consumption of public goods for private alternatives)? This question seems to fall into the wheelhouse of municipal governments. Phased in slightly different form, how might city planners transform the experience of daily life in ways that would induce the residents of well-heeled communities to forsake leisure travel? An answer begins, as Halina observes, with housing, but good life goes beyond the features of accommodation. In fact, it brings to the surface issues that have bedeviled urban visionaries for more than a century. Commanding figures like Corbusier, Patrick Geddes, Ebenezer Howard, Frederick Law Olmstead, and Lewis Mumford wrestled with these challenges when formulating their ambitious—and sometimes fanciful—ideas. Housing was often central to their plans, but so were parks, transportation, and other components of urban and regional infrastructure. The master planner Robert Moses forcefully implemented these prescriptions—and inspired others elsewhere to act similarly—when he put into effect his own time-bound and ultimately controversial understanding of good life. In coming back to the essence of Halina’s posting, we could as an alternative thought experiment pursue the question of how might municipal governments reconfigure public space to encourage affluent residents to renounce discretionary travel. In other words, what would induce them to voluntarily spend more time in the communities in which they otherwise live? By interesting coincidence, I found myself reflecting on this query last month while on a short trip to California (for a couple of academic conferences!). During my travels, I managed to devote one day to a bicycle trip into the Berkeley Hills and beyond, traversing the public lands maintained by the East Bay Regional Park District. I spent another day doing much the same thing through the coastal enclaves immediately north of San Diego. I was inspired on these jaunts to speculate how, living in such a place, I could readily adopt a lifestyle that did not require elective travel merely to alleviate monotony. Of course, my preferred routines would not have universal appeal, but that is the point: How might local planners develop a heterogeneous mix of opportunities that enabled a wide array of people to enjoy good life? As harsh and unforgiving as it may sound, we probably should not, at least for the time being, be overly concerned with the most tragic and hopeless cases. We need to adopt the hardhearted posture of a battlefield surgeon and strategically focus efforts on communities that have the capacity and will to embrace an ambitious agenda for change. They can become the exemplars of what it means to enable good life in the twenty-first century. Any candidates care to step forward and identify themselves? If income inequality were to be addressed with a carbon tax and dividend, everyone would be encouraged to enjoy their lives in lower-footprint ways. Doesn’t this make a carbon tax and dividend something like a “magic bullet”? There’s no magic bullet with respect to reducing carbon emissions; no one actually knows what a sustainable humanity would look like. Actually, in my view, we need to get carbon negative fast AND take out all the carbon we put in the atmosphere. There’s lots of cool things happening, but there’s lots of momentum in the present system and a quick turnaround is just not realistic.